Tablic is simple and very interesting card game. With catchyinterface, clear big cards and smooth animations, Tablic Masterswill make you have fun with thousands of other people whilesharpening your brain at the same time. All you need to know toplay it is mathematical addition with numbers up to 14. In essence,just sum the cards on the table and take them with your card. Butif you are able to remember past cards and think in advance you canget it to very high level. Tablic Masters is online interactivegame so you compete with other people logged in from their phonesand computers. It is also available on Facebook under the samename. You can login to Tablic with your Facebook account eitherfrom the computer or your Android device or you can play as Guest.If you login with Facebook account, you can take over the game fromone device to another without loosing time and points. Facebooklogin also gives you free daily chips for playing. Enjoy! Zsiros, zsirozas, sevens, sedmice or "grease it" is simple and veryinteresting trick card game. With catchy interface, clear big cardsand smooth animations, Zsiros Hetes will make you have fun withthousands of other people while sharpening your brain at the sametime. The game is usually played with Hungarian (German) deck. Allyou need to know to play are a few simple rules: - first player whodrops is the lead - the other player(s) tries to match the card ontable by number - the last who matched takes all from the table -seven (VII) is a wildcard (joker) - collect tens (X) and aces (D)Although rules are simple, if you are able to remember cards andthink in advance you can get it to very high level. Zsiros Hetes isonline interactive game so you compete with other people logged infrom their phones and computers. It is also available on Facebookunder the same name. You can login to with your Facebook accounteither from the computer or your Android device or you can play asGuest. If you login with Facebook account, you can take over thegame from one device to another without loosing time and points.Facebook login also gives you free daily chips for playing. Greaseit! 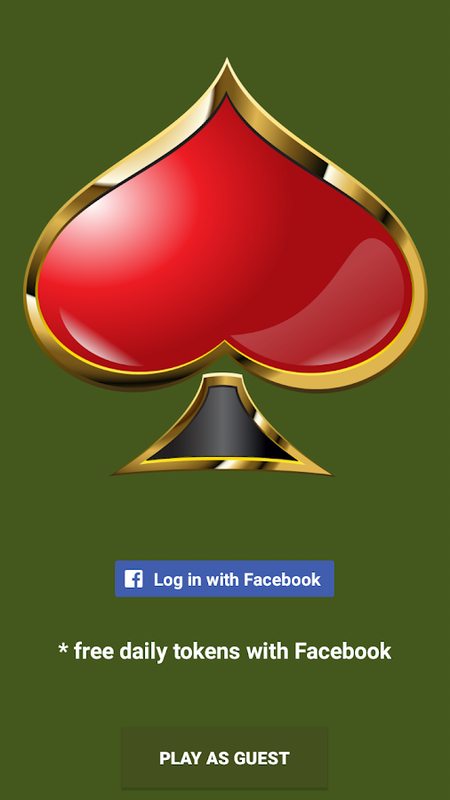 The top-ranked free Hearts card game with: Live online multiplayer• Achievements • Statistics • Game options • Smart AI opponents •Frequent updates • Lots of happy players • Play Hearts now! Hearts+is the premier free Hearts card game for smart phones and tabletsand is now available on Android! Hearts+ has been in developmentfor years by a dedicated team and has seen countless new features,improvements, and bug fixes. It's fast, stable, always improving,and above all fun! Top Features include: * Play Hearts online withyour friends and everyone else! * Realistic look and feel, justlike sitting at a card table! * Game options, including "Jack ofDiamonds" * Achievements, some easy, some hard, can you get themall? * Challenging and competitive computer opponents * Automaticgame saving, just in case you get a call right before shooting themoon * Simple tutorial to help beginners get in the game fast *Free! What players are saying ★★★★★ "Without a doubt the best gameof Hearts!" ★★★★★ "Best hearts program by far. THE best!" ★★★★★"The opponents are good players unlike other hearts games..." ★★★★★"Terrific! I play it every day." ★★★★★ "Hooked. Absolutely hooked! "★★★★★ "Play this! I love this game. What more needs to be Said?"